1. These dress pants are only $15 - and comes in 6 different colors and prints. 2. This top with a slight bell sleeve would be perfect for work or dressed up with jeans. 3. I love leopard print - and this faux fur jacket would be perfect. 4. I love a chunky knit sweater - and this one is only $20 - and comes in three colors. 5. This embroidered denim jacket is so on trend and a great price. 6. This sweater is on sale for $20 - and comes in four colors. 7. This cardigan is on sale for $25. 8. These leopard print pumps are only $28 - and the cheetah print ones are $20. 9. This v-neck sweater in a pretty peachy color (which is really on trend) is marked down 40% off. 10. This cardigan is 40% off. Just in case you missed it - yesterday I shared my top five boots for fall. I also shared my top five fall sweaters. 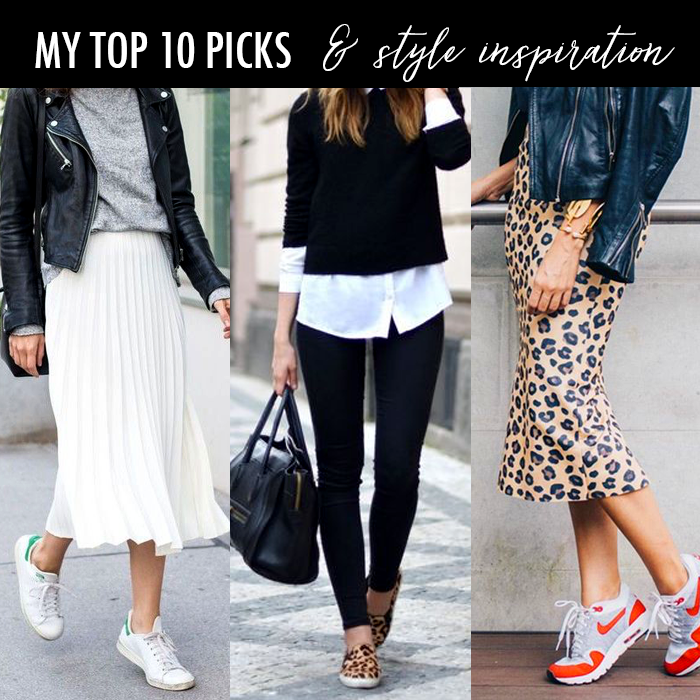 I love that sneakers are totally in style to wear with just about everything. That makes my teacher feet very happy! I love a good cardigan! You picked some good ones!